Thinking of sketching reminds me of life drawing.. 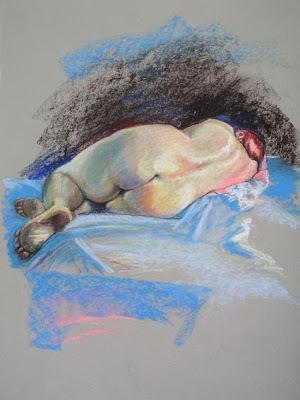 Thinking of sketching reminds me of life drawing and that I miss doing it. I was going to a life drawing session that got canned because the venue was closing. So then I tried to go to one that was further away, which was really good because it was longer and had two models... but it was late on Friday night's and very inconvenient to get to, so I stopped at the end of last year. I'd really like to get back into it. I thought it was about time I put up something else here. This is a made-up face I did to try out the ArtRage 2.5 paint program.... I did the above sketch using the Pencil brush on the face (well, plus the eraser! ), and the chalk brush on the hair. I used the chalk brush because the pencil brush does not enlarge much and stays as a relatively small line. I was testing out the Pencil brush because it was recommended by Frog as a very good sketch tool and I can't resist trying out paint programs. I decided to purchase the full ArtRage (I already had the free version but never really used it) because the v2.5 looked a lot better. 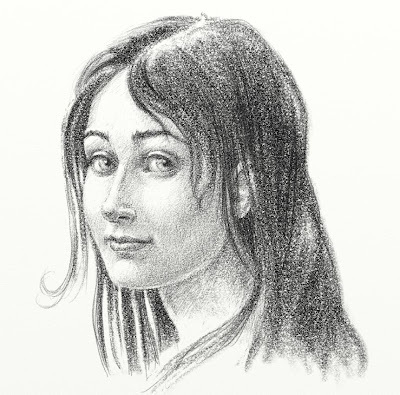 I have to say that I really like the pencil and chalk tools. Feels much more like using a real pencil as you can actually shade properly (can't do this very easily in any other program - you end up with a load of lines not proper pencil shading). The only problem I found was that you have very limited control on texture the darker you get. Especially with the Chalk. You can adjust and change the paper texture which will affect the brush texture, but it's not particularly intuitive, and I would like a bit more control over the brushes themselves. However for roughly £15(incl vat)(US$25) I can't complain. It will be very useful for doodling out rough ideas. I did find that exporting to .psd did make the image come out slightly darker (I was only using black and white), but exporting to .tiff did not affect the tone. However this could be easily corrected in Photoshop using levels. There's some niffy stencil and ruler options and the ability to rotate the canvas is great. However some of the functions are not obvious and hard to find.... ie if you want to permanently flip a layer you have to click on an arrow next to the selected layer, select 'Transform Layer Contents', then a tool bar will pop up, then you have to click on the side arrow and select flip horizontal or vertical. Admittedly, after you have selected 'Transform Layer Contents' you can just hit 'H' or 'V' but it's a bit longwinded. Hitting 'H' or 'V' in normal circumstances will flick your image either horizontally or vertically while you hold the key down, which is handy, but you can't draw on the flipped image. Plus there's no selection function, so you can't cut and paste parts of a layer, although you can rotate, scale or flip the entire layer through the 'Transform Layer Contents' function. I'm less keen on the paint tools - bit too hit and miss for my tastes. I'll be sticking with Painter X there still. You can get rid of the impasto look on the paint by hitting the F5 key (PC), you loose the paper texture on the screen, but the pencil/chalk/crayon textures still work. I personally found the brushes cluncky when it comes to subtle blending and I still wanted to be able to tweek them more to my taste. So for sketching... yes, for painting (me personally)... no. Though it's a great introduction for anyone just starting into digital painting, without breaking the bank.